Got anything fun planned for Sunday brunch? You do now. 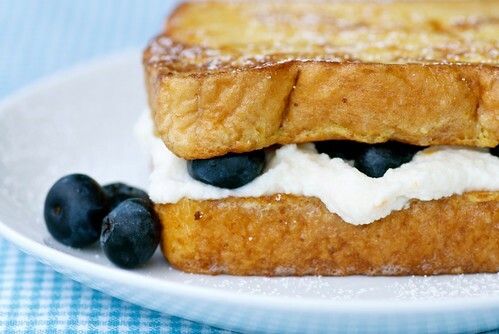 Pillowy, Cointreau-spiked ricotta and juicy fresh blueberries are nestled between two buttery slices of French toast. After just one bite, you'll be laughing. 1. In a shallow bowl or pie plate, lightly whisk eggs; add milk, cinnamon, vanilla, and orange zest and whisk until well combined. 2. Place griddle over medium-low heat. (Note: If the heat is too high, the butter will burn.) Melt about 2 teaspoons butter until the griddle is just coated. 3. Dip one slice of bread in the egg mixture until well coated on both sides, allowing excess to drip into the bowl. Place on the griddle. Cook 1 minute per side, or until golden brown and the egg has set. Transfer to a warm plate and cover until ready to serve. Repeat with remaining slices, buttering the griddle as necessary. 4. In a small bowl whisk ricotta cheese, orange zest, Cointreau, and sugar. To assemble sandwiches, spread 1/4 of the ricotta filling on a slice of French toast. Top with 1/4 blueberries. Close the sandwich with another slice of French toast. Dust with confectioners' sugar. Cointreau-spiked ricotta and juicy fresh blueberries are nestled between two buttery slices of French toast ... hoho sign me up! Cointreau even! What a Sunday start! I can't wait for Sunday morning! This is heavenly! makes me want to have breakfast again right now. pancakes move over. your French toast is taking its place. Beautiful photo! That sounds delicious. I made these with my kids on Sunday morning and they were a HUGE HIT! I skipped the liquor and used orange extract instead. It was perfect. Thanks so much! I am trying this with my class when we make French Toast. What a great photo!